This is the first in what I am imagining as a series of posts about the Bible in which I want to say how and why I find the Bible essential for my spiritual life. I hope these musings may be useful to others. I know the Bible has come more to divide Friends than hold us together, but I believe it could be useful in our finding greater unity among Friends. The reflections in these posts about the Bible draw on material I presented at the Midyear gathering of Iowa Yearly Meeting Conservative, and on reflections that Friends at that gathering shared with me, as they welcomed me into their midst. I remember there was some ceremony attached to the presentation. A group of us, all about the same age, received our Bibles together, from the church’s Himandher Club. That was a fellowship organization within the church for young married couples (him and her, get it?). The signatures are those of the Senior Minister, George Ulp, and the Associate (or Family) Minister, Carl Simon. Along with my parents, those two were as responsible as anyone for my religious education as a boy. What I don’t remember is anyone saying anything about the Book I was receiving. No one told me who wrote it. No one said why it was worth my attention. No one told me how to read it. It just was: here, take this as a gift, you’ll want it and need it. They were right. Today, I do want it and need it. Nevertheless, I wish they had said more about why it was something of value. For a few years, it was a book I took care with because it was a gift. Then, in my teens, it became a gift I treated like something from a distant and elderly aunt or uncle. I knew the givers meant well, but this wasn’t really for me. How could it be, they didn’t really know me. Even when it followed me to college, it mostly stayed on the shelf. Years later, I have come to know it better. From time to time I would pick it up and read parts of it for one reason or another. Later, I began reading it more regularly. I’m not sure I can say why, but I found things in it that deepened my spiritual life — along with things that left me cold. Still later, I began reading scholarship and commentaries about the Bible, and that drew me further in. Today I have come to view the Bible as a gift. 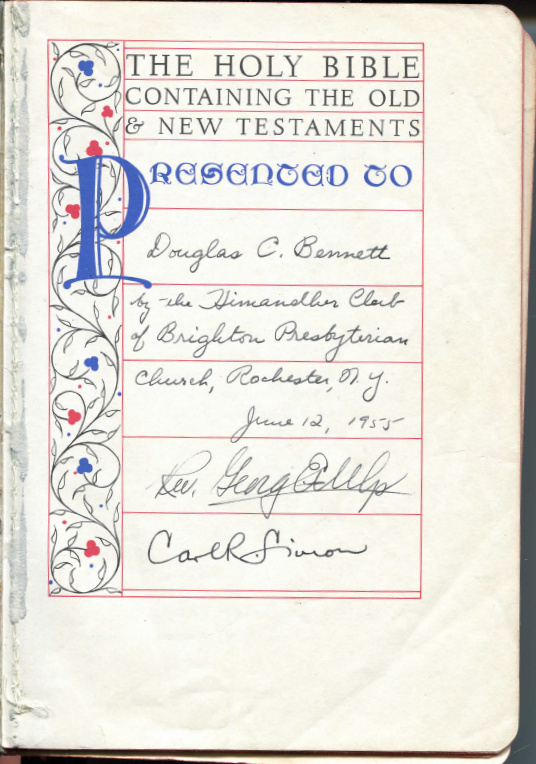 I am grateful to the Himandher Club and to George Ulp and Carl Simon for the gift of my first Bible. The gift isn’t really from them, however. I have come to view the Bible as a gift to each and all of us from the earliest Christian communities. I imagine their worship life together was largely face to face, largely oral. As communities of Christians took shape in places separated by distance, they began to communicate by letter. Someone might write down a sermon so it could be passed along. As the years passed, someone might write down as much of what he (could it have been she?) had heard about Jesus’s life, ministry, crucifixion and resurrection because there was no longer anyone alive who had first-hand recollection of those events. Eventually, we don’t quite know how, some of these materials were gathered up into collections, and still later, an agreement was reached on what was ‘the good stuff’ — which was the best collection. That is the Bible we have today. The Bible is a gift, a gift from very early Christians to those who live on this earth after them. Knowing it is a gift only tells us a little about the Bible, but it does tell us that someone cared enough to see we had it. Like all gifts, we have to decide what to do with it: shelve it? read it? regift it? discard it? recommend it?